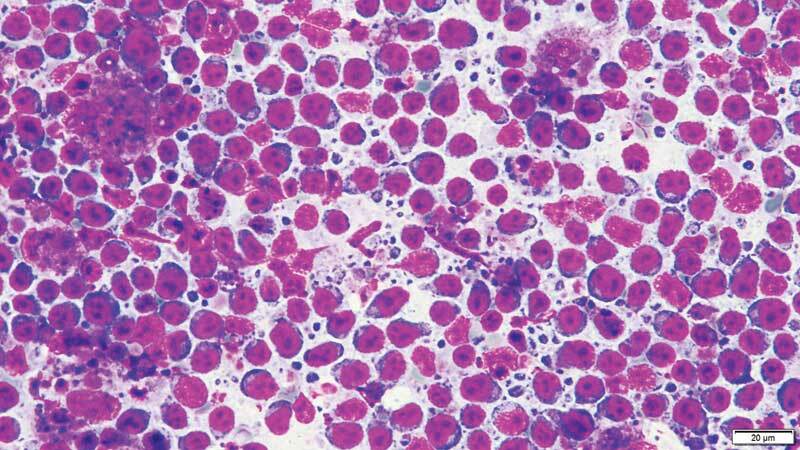 Slide of a nine-year-old shih tzu MC with enlarged right cervical LN with a diagnosis of lymphoma in medium-power magnification. Using digital cytology and remote pathologists can provide rapid turnaround times to clinics around the world and accurate results.1 However, there are concerns extremely small or rare bacterial organisms may be missed when using digital cytology, although this has not be validated in the scientific literature. From abdominal effusion to joint taps and everything in between, cytology has always been a minimally invasive cornerstone of diagnosis, and with digitization, can be more convenient and reliable, given the immediate access to clinical pathologists. Keep in mind cytology samples requiring unusual stains are not candidates for digital cytology, as centralized labs are currently the only groups carrying these substances. In addition to the accelerated speed of diagnosis, digital cytology can reduce costs at multiple points (e.g. courier services, as well as technologist and infrastructure costs) and allows pooling of expertise across large geographic areas. (The cost of analysis ranges from $40 to $80.) It can also provide permanent archiving of case material for future consultations and research. Incorporating digital cytology into a practice can allow veterinarians and their clients to make rapid and informed decisions. A wide variety of applications are possible with this technology: enlarged lymph nodes can be evaluated for lymphoma; abdominal effusion can be checked for sepsis; spherocytes can be confirmed in suspected immune-mediated hemolytic anemia; masses can be assessed for surgical planning; and malignant cells can be detected for staging—the list goes on. 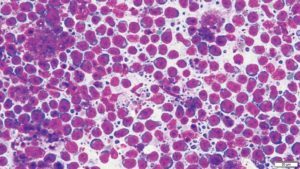 Consider this: If we can identify a mast cell tumor relatively quickly, why not schedule surgery before the dog has even left the building? This brings us back to Smoosh. Less than 45 minutes after telling Mr. Rush you’ve sent digital images of Smoosh’s slides for pathologist review, you deliver the diagnosis. Mr. Rush’s impatience quickly converts to concern for Smoosh. He’s grateful to you for your thoroughness and is eager to begin the treatment you recommend. Conor Blanchet is the chief operating officer for Lacuna Diagnostics, a digital cytology company located in Fort Collins, Colo. He has an MBA from Colorado State University and is currently on a leave of absence from the DVM program at the same university. Blanchet’s background in clinical veterinary medicine and pathology has helped Lacuna Diagnostics bridge the gap between clinicians and pathologists. He can be reached via email at conor@lacunadiagnostics.com.